More sunshine and mild temperatures are on the way for Winnipeg as the spring melt continues. A strong upper-level ridge moving into the province will provide plenty of warm weather for Winnipeg over the coming days. With high pressure aloft and at the surface, the city will also see plenty of sunshine and fairly light winds. Today will start off with light northwesterly winds diminishing midday as a ridge of high pressure. Under partly cloudy skies, the city will see temperatures climb to a high near +2°C. Winds will pick up out of the southwest overnight to around 20 km/h ahead of a warm front pushing through the region. Temperatures will dip to a low near -1°C. Thursday will bring mostly sunny conditions to the region with winds shifting northwesterly in the morning. 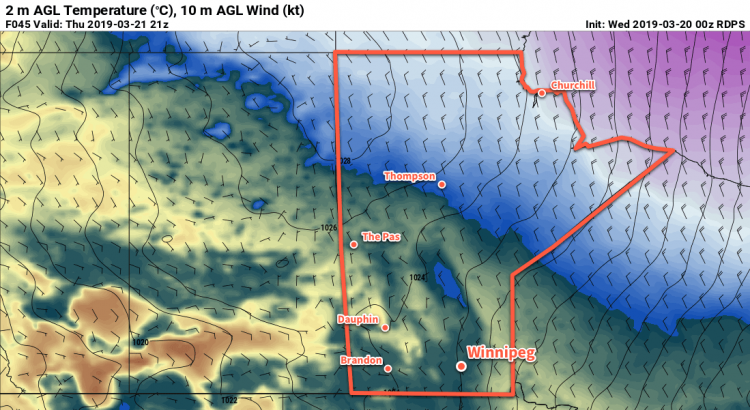 Winnipeg will see a high near +3°C, although any areas where the snow pack is thinning out may see temperatures a couple degrees warmer than that. The winds will ease Thursday evening as a high pressure system pushes into the province. Temperatures will dip to a low near -5°C on Thursday night. Friday will bring Winnipeg similar weather to Thursday. The city will see mostly sunny skies, light southerly winds, and a high near +4°C. Temperatures will dip down to around -3°C on Friday night. The mild weather will continue into Saturday. Forecasts show a weak cold front pushing through for Sunday, bringing a chance of rain showers or snow flurries as it passes and returning temperatures to seasonal values for Sunday. The city should still see a fair amount of sunshine on each side of the front, though! Today’s seasonal daytime high in Winnipeg is +1°C while the seasonal overnight low is -10°C.